Notable Northern Ireland Singer Kaz Hawkins Set to 'Shake the States' on Promotional Tour. The winner of the U.K. Blues Challenge takes her act on the road for select dates in the U.S.
Irresistible…inspirational…irrepressible. These are all qualities that encompass the essence of Northern Ireland's Kaz Hawkins—the singer-songwriter known for her voracious vocals and riveting stage persona. It was announced today by her U.S. management, Lucy Piller of All Right Now Entertainment—in conjunction with Muscle Shoals Radio and Wilson-Piller Promotions--that Kaz Hawkins is set to infuse the U.S. with her bold and brash brand of soulful blues. Kicking off on December 7, 2016, American audiences will have the opportunity to experience the enthralling artist with her upcoming promotional tour, "Shake The States". As Piller puts it: "I have no doubt in my mind that Irish singer Kaz Hawkins will blow everyone away in the USA--it's time to share this one-of-a-kind 'soul superstar' with America—and beyond!" Hawkins--the recent winner of the UK Blues Challenge--will be bringing her sizzle and sass to the states of Georgia, Arkansas, Tennessee and Alabama for select dates, which will include The Vista Room in Decatur, GA (Dec. 7th), The Snug in Canton, GA (Dec. 8th), The Winery in Nashville, TN (Dec. 9th), Fame Studio in Muscle Shoals, AL (Dec. 10th), Stephano's in Sheffield, AL (Dec. 11th) + Swampers in Florence Dec 11th - Florence Academy of Fine Arts in Florence, AL (Dec. 12th), Lyric Theatre in Harrison, AR (Dec. 17th) and MadLife Stage & Studios in Woodstock, GA (Dec. 22nd). Of her upcoming visit, Ms. Hawkins' enthusiastically shares, "I'm so humbled and thrilled to visit some of the places that have inspired my songwriting over the years. I can't wait to experience this journey and bring amazing memories back to Northern Ireland with me--as everyone at home is excited too. With the great support from Lucy Piller of ARN Entertainment and Kiki Plesha of Rock Mother Promotions, I just know this will be the beginning of a very special future." The U.S. media is already taking notice of Kaz Hawkins—the popular music publication ION Indie Magazine has scheduled a photo shoot and interview with the engaging artist--in anticipation of her appearance in their February 2017 edition—where she will both command the cover and the feature story slot. 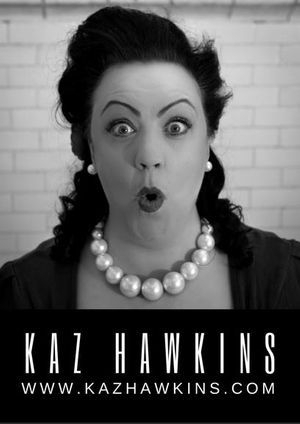 For booking or additional information on Kaz Hawkins, contact her U.S. management, Lucy Piller of All Right Now Entertainment at: lucy@allrightnow.com.